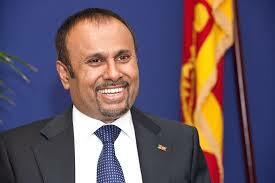 The Colombo Fort Magistrate this morning issued an INTERPOL warrant on former Ambassador to Russia Udyanaga Weeratunga. He is being investigated by the Financial Crimes Investigation Division (FCID) of the Police for financial fraud amounting to US$14 million. Weeratunga is accused of having directly intervened in a questionable transaction, while procuring MiG-27 ground attack crafts for Sri Lanka. The FCID had previously sought to have a warrant issued through the INTERPOL but were turned down.